Welcome to Mandalay. Enjoy the magnificent sunset views from Mandalay Hill before your welcome dinner and a night at Mandalay. Afterwards board Scenic Aura and enjoy tonight’s welcome reception whilst cruising to Mingun. Optional Hot Air Balloon Flight – Take a hot air balloon flight over the majestic temples of Bagan. Flights last approximately 45 minutes and must be purchased prior to your cruise to guarantee availability. (Plese note: available only from late-October to mid-March; all flights weather permitting). Freechoice: Venture to Mount Popa, home to Myanmar’s nats or nature spirits, before heading to a Toddy Farm where a traditional lunch awaits. Alternatively, explore the markets at Nyaung U before either exploring the Temple Circuit, or enjoying a visit to Old Bagan. Travel to Clay Pot ‘mountain’ and indulge in a relaxing drink while soaking up magical views over the Bagan plain. Tonight attend a traditional string puppet show. Rise early to attend morning alms for the local monks and be invited to eat mohinga, a traditional breakfast with the local people. Later travel by horse cart through a local village and the temple ruins before learning all about the production of Burmese lacquerware. Later continue cruising downstream to Salay. On your walking tour explore Paya Thonzu, a small trio of brick shrines, admire Youqson Kyaung, a beautiful teak monastery and look inside the largest lacquer Buddha image in Myanmar. From the river front, soak up the ambience of the river and the colonial feel of the town whilst enjoying traditional local Burmese tea and snacks in a restored colonial villa dating from 1906. As the sun sets, wander around Shwedagon Pagoda and learn about the ritual of ‘oil lamp lighting’ before partaking in this local tradition. 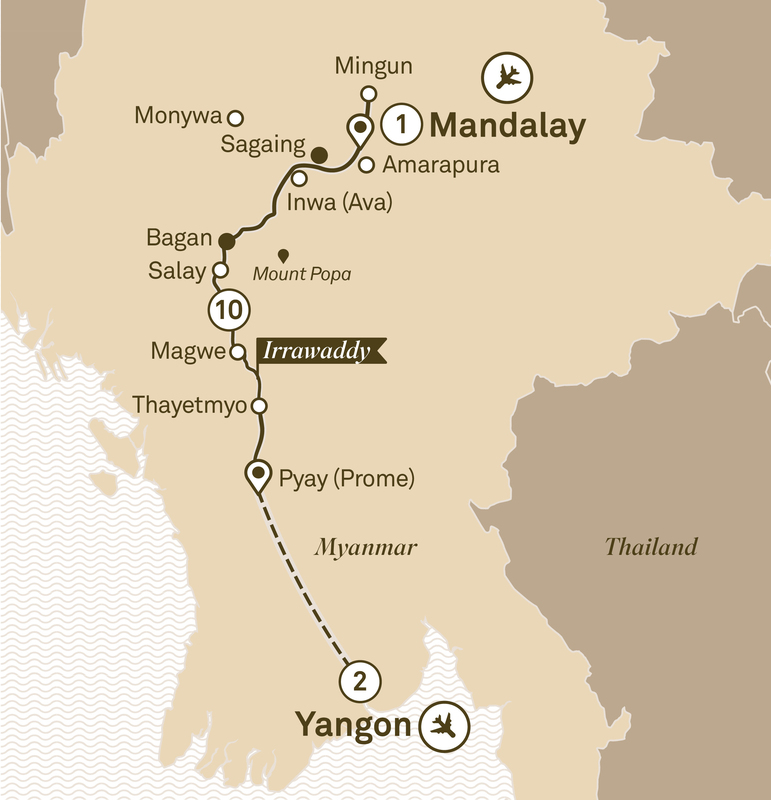 Say Thaw Dau Mal to Myanmar.